Dread via its distribution parent, Epic Pictures, will continue to release films that tell horrifying stories but they also strive to raise awareness of historical, political, and/or current social issues. They are focused on changing the female/male stereotypes by putting strong women in traditionally male roles. With projects like LUCKY, THE GOLEM, and the upcoming creature feature, SEA FEVER, starring Hermione Corfield (STAR WARS: THE LAST JEDI) and Connie Nielson (WONDER WOMAN), Epic Pictures and Dread are helping to rewrite the narrative for women in genre entertainment. Established in 2007, Epic Pictures Group has grown to become one of the most creative and dynamic independent studios. Focusing on filmmaker-driven projects. Epic often helps shape them from script to launch via its domestic distribution division, Epic Pictures Releasing. Epic Pictures Group seeks out relationships with exceptional producers and talent in order to secure A-level, high-quality projects. Epic Pictures Group actively develops a full range of new relationships and strategic alliances with financers, independent production companies, producers and studios both domestically and in Europe and Asia. Epic Pictures recently acquired Dreadcentral.com and now features horror titles through Dread Central Presents." Broken Ghost Trailer and Release Details: "Clay Epstein’s Film Mode Entertainment is pleased to announce the North American release of BROKEN GHOST. Written by ABE POGOS & CATHERINE HILL (SUGAR MOUNTAIN) this captivating and haunting film tells the story of one girl’s struggle with bullies and her rise to confront her demons, starring SCOTTIE THOMPSON (12 MONKEYS, THE BLACKLIST, STAR TREK). The talented female-driven cast is further bolstered by NICK FARNELL (WHERE THE WILD THINGS ARE, THE MULE), DEVON BAGBY (RAY DONOVAN) JOY BRUNSON (THIS IS US, SHAMELESS), GEORGE GRIFFITH (TWIN PEAKS) and introduces a stellar performance by up-and-comer AUTRY HAYDON-WILSON. About Film Mode Entertainment Film Mode Entertainment is a leading worldwide sales agent, production entity and distribution company, focusing on commercially driven feature films of all genres and budget sizes. Film Mode represents projects at all stages of the filmmaking process, often as Executive Producer, with the aim of helping producers and distributors achieve maximum exposure for their films. Film Mode’s recent successes include SUGAR MOUNTAIN starring Jason Momoa, LITTLE PINK HOUSE starring Academy Award nominee Catherine Keener and VIKING DESTINY starring Academy Award nominee Terence Stamp. Upcoming releases include CRYPTO starring Kurt Russell, Beau Knapp, and Alexis Bledel, STAGE MOTHER starring Academy Award nominee Jacki Weaver, Lucy Liu, and Adrian Grenier, and BURN starring Josh Hutcherson and Suki Waterhouse. Additional titles include THE GOOD NEIGHBOR starring Academy Award nominee James Caan, and GANGSTER LAND starring Milo Gibson, Sean Faris, Jason Patric, and Jamie-Lynn Sigler. DocMode, Film Mode’s Documentary label was launched to focus on award-winning Documentaries that impact the world. BALLERINA, the first film under the label had its American debut in 2018. Film Mode is based in Beverly Hills, CA. The Yellow Brick Films team have produced eight independent feature films across the US and Australia. Whilst they draw on their collective experiences and skills, they exercise a highly tuned collaborative approach to filmmaking by maintaining a strong and knowledgeable team of like-minded people across all projects. Through the successes of their previous ventures, Yellow Brick Films continues to produce quality, independent feature films each year. 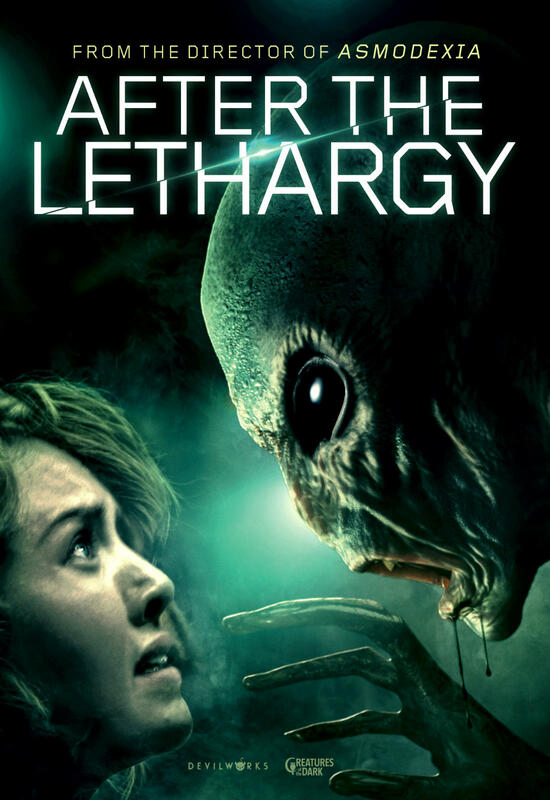 Click here for more information: http://www.yellowbrickfilms.net"
After the Lethargy: "A new trailer has been released for alien sci-fi film ‘After The Lethargy’ from writer/director/producer Marc Carrete (Asmodexia, Framed). Pic tells the story of a young journalist who travels to a war shelter, where one of history's most terrifying alien abduction occurred and discovers she is being hunted by a family of hybrid human aliens. Starring Andrea Guasch (Submergence), Joe Manjón (Framed, The Man Who Killed Don Quixote), Ramon Canals (Asmodexia) and Mark Schardan (Realive). After The Lethargy was produced under Marc Carret’s Spanish production companies After The Lethargy AIE and Creatures of the Dark and is his first feature in English. The film screened at Terror de Molins, Buenos Aires Rojo Sangre and won Best Scare at the 2018 Horror Movie Awards and Best Sci-Fi at 2018 New York City Horror Film Festival. Marc Carrete and Charles Hamilton executive produced. Devilworks will be exhibiting at EFM in the Marriott Hotel Office #248 7th - 13th Feb."